LaToya Ruby Frazier, The Martin Luther King Jr. Living Memorial in Marquette Park, Chicago. Courtesy of "The Atlantic"
Today, April 4, 2018, marks the 50th anniversary of the assassination of Dr. Martin Luther King Jr. The Atlantic has commemorated the anniversary with "KING," a special issue, "which refracts King’s life through the prism of his three main preoccupations of racism, poverty, and militarism, contains rarely published speeches by King, material from The Atlantic’s archives, photography, poetry, and original essays and interviews." For the issue, Associate Professor in the Photography department LaToya Ruby Frazier documented how King's assassination affected the physical structure of three cities: Memphis, Chicago, and Baltimore in her photo essay "The Geography of Oppression." 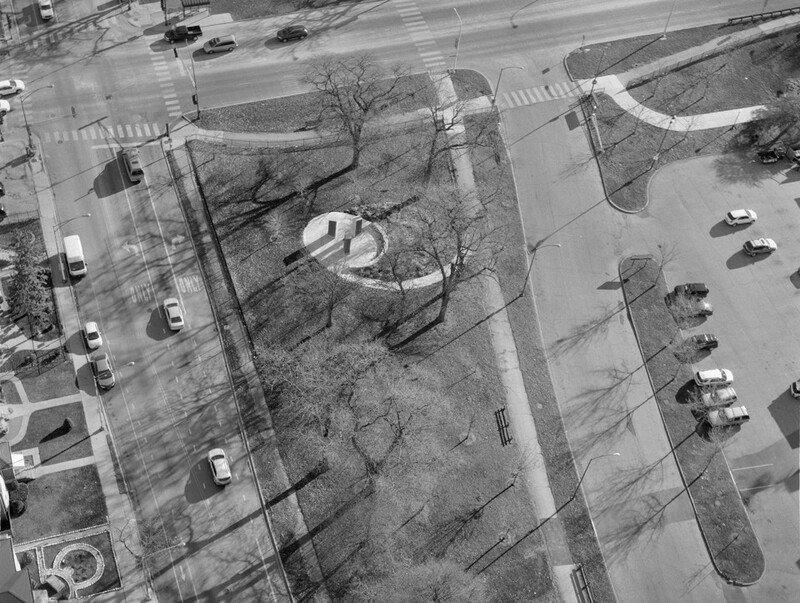 Shooting from a helicopter with film techniques associated with late 20th century documentary photography, Frazier's poignant photographs show how King's assassination has influenced the structure of these cities and how the civil rights leader is memorialized in monuments, streets, and schools. "These images are so much about the shadow and the history and the spirit of how King was there. It's like capturing the spirit of King in these landscapes," says Frazier. View the full photo essay here.